A perfect place to take a walk is along a beautiful lake in the Finger Lakes. Seneca Lake in Geneva and Canandaigua Lake in Canandaigua are only two of the lakes that offer walking paths along the shoreline for the public. The Keuka Lake Outlet Trail runs along the canal that connects Seneca Lake in Dresden to Keuka Lake in Penn Yan. This trail welcomes bicyclers to its seven and a half mile journey that gradually drops 270 feet. If you are an athletic bicycle rider that wants a challenging incline start in Penn Yan. However, if you are an average rider you may want to start in Dresden and head toward Penn Yan, that way gravity is on your side. Watkins Glen State Park is a perfect place for a hiking adventure. The main attractions at this state park are the trails through the Glen, specifically the Gorge Trail. The trails take you through tunnels, over bridges and under waterfalls. Not only is this a great place for hiking but also a great place to enjoy the scenery. The park is home to numerous stunning waterfalls and layers of rocks. You’ll get hooked on waterfalls and will want to find more. 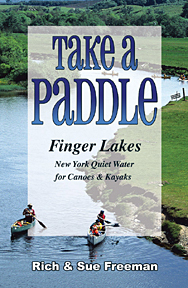 The guidebook 200 Waterfalls In Central & Western New York – A Finders’ Guide is just the ticket. “Flat water” is the technical lingo for docile streams that drift along with a gentle or nonexistent current. Without major drops in elevation, they don’t plummet over waterfalls or roil in rapids. You can drift down them with a leisurely paddle and not worry too much about sharp turns or impediments along the way. Of course, even the most docile stream can get a blown down tree from a storm or become an angry torrent with enough rain or snow melt. Generally, if you’re looking for a docile stream you should limit your paddling to summer and fall. Docile streams also lend themselves to two-way travel. Without a strong current you can paddle both upstream and downstream. This means you don’t have to hassle with spotting a car or arranging for a shuttle. Circumnavigate an island. 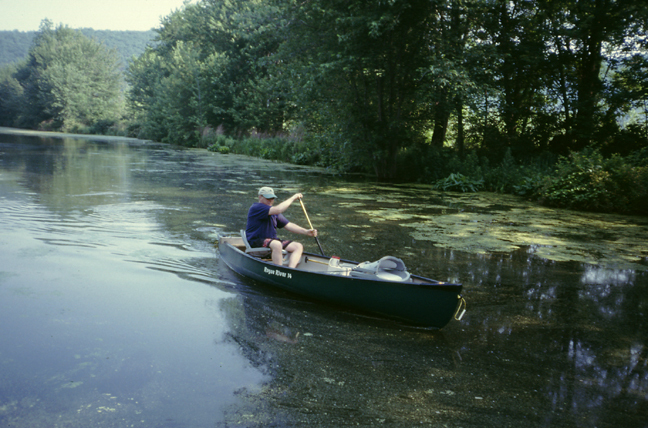 Using a section of the Erie Canal and a remote loop of the Seneca River you can paddle 10.7 miles around Howland Island. This is part of the Northern Montezuma Wildlife Management Area so be sure to take your binoculars for the excellent bird watching opportunities. a meal, a drink, or ice cream. 4. West River Marsh at the south end of Canandaigua Lake is a lazy stream that can be paddled year-round, except when frozen. Enjoythe peace and quiet tucked below the towering hills that surround Canandaigua Lake. Naples is known for its grape festival. Grape stomping, grape pies, sips of luscious wines – it’s all wondrous fun in the fall. But, Naples has another claim to fame – one that is centered squarely in summer, and one that I find more fun than eating a grape pie. And, I’m a grape pie lover! To me, Naples is synonymous with creekwalking. Off the Bristol Valley hills run 4 streams that converge in the Naples Valley to fill Canandaigua Lake. They provide a summer playground for those of us with a sense of adventure and a willingness to get wet. The most well know is Grimes Glen which houses Grimes Creek as it flows directly into the village of Naples. Splash into the one foot-deep stony creek bed and head upstream in the cool water. In less than half a mile a waterfall will crash 60 feet down a side tributary to join Grimes Creek. In a little over half a mile you’ll find another 60-foot waterfall, but his one sits a bit off kilter in Grimes Creek and blocks your upstream passage (see photo). No matter. Play in the spray then head back downstream having enjoyed a hot summer day. Creekwalking is for those with adventurous spirits. You will get wet – it’s the objective of creekwalking. The footing can be precarious. Mosses and lichens make rocks slippery and you have to watch carefully where you place each footstep. The reward is finding new delights with every bend of the creek. On the opposite side of Route 21 in Naples you’ll find Tannery Creek. Practice at Grimes Glen, and then go tackle Tannery Creek. In this stream you’ll climb a succession of small waterfalls until you reach a 40-foot-tall one and have to turn around. Further honing your creekwalking skills, try your hand (or should that be foot?) at Clark Gully next. Then, the piece-de-resistance: Parish Glen (a.k.a. Conklin Gully). This place is for true adventurers. The climbs can be steep, with few handholds. You never know what you’ll find around the next bend, but usually it’s another waterfall. Each is different, and each is spectacular in its own right. Climbing up waterfalls as you creekwalk, such as is necessary at Conklin Gully, can be scary. Turning around and climbing back down is even scarier. Never climb up beyond your level of comfort. The good news with Conklin Gully is that if you make it to the top, you can follow a trail back down. Bring out the inner adventurer in you and head to Naples this summer for some unforgettable adventures. 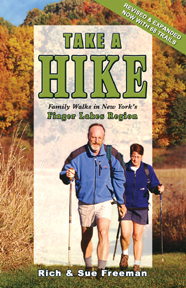 All the information you need to find and enjoy these creekwalks can be found in “200 Waterfalls in Central & Western New York – A Finders’ Guide” at www.footprintpress.com, or call 1-800-431-1579.